One of my favourite scenes in cinema is, in fact, not really a scene at all but a moment; a collection of three shots that has very little to do with the overall narrative but everything to do with the humanity questioned in the film. 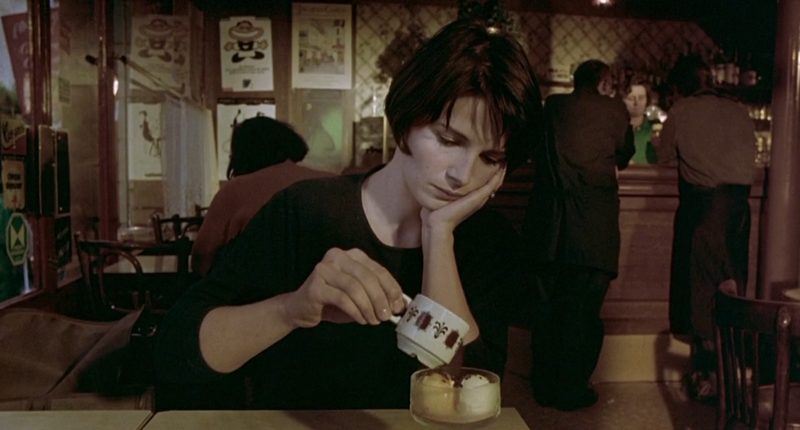 The film is Krzysztof Kieślowski’s Three Colours: Blue (1994) and the moment is when Juliette Binoche, playing a woman in mourning, is walking by a house. The film follows Binoche’s character, Julie Vignon, after her husband and son have been killed in a car-crash which she has survived. The film is a chartered progression in Julie’s grief, following her in a series of vignettes that lead to her further understanding, both of the misdemeanours of her deceased husband and her new place in the world now that her personal life has been publically and violently shattered. The film is layered with gentle symbolism of each stage in her grief, culminating in the concluding of an unfinished piece of music by her composer husband. The film, in essence, captures the universality of grief but through the prism of a deeply personal specificity like all great cinematic transcendentalists. The moment in question, however, is not essentially part of the overall schemata of the film, aside from signposting (along with various other scenes) where Julie is at emotionally within the narrative. The best description of this juncture is “raw,” though why this is will be returned to later. This moment of walking does not essentially need to be in the film at all; it’s a further addition to Julie leaving the family house, now filled with uncomfortable ghosts. She is at the height or mourning, about to dive deep into the pool (an image that finds a genuine realisation some time later on). The rawness of the realisation, far and away from, for example, when she watches the funeral on television, is at its most frank here even though Julie is shown to be far more emotional at other points in the film. I believe it to be the most effective presentation of grief because it accurately shows its fractured, fluctuating sense, the character trying to combat the numbness that comes from a sudden loss. Julie is not merely walking in this twenty seconds or so, but is trying to reassert herself, contradicting her potential distancing from all emotional relationships, even her emotional being within. In the shots, Julie is walking away from the family’s country house. The first shot looks back towards her as she leaves, walking along the driveway boarded by an old stone wall. She is walking with a box of possessions under one arm, the other arm initially limp and hanging down almost like a dead weight. The second shot cuts from this to Julie’s hand which instantly lashes out and begins to drag along the stone wall, her knuckles being cut by the sharp rocks and stones. The third then shows her reluctantly walking away, dragging her hand no more against the stone before the scene cuts. It’s a simple moment in terms of editing but beautiful in its quick and skilful portrayal of the character’s current emotional turmoil. There’s some speculation as to whether Binoche improvised this moment, the relationship between actor and director often denoted by a sense of improvisation (even if the director was often against such improvising when the camera was eventually rolling), but, either way, the moment is a stunning portrayal of someone trying to break away from an numbing grief. This isn’t a numbness in the sense of stasis, but a numbness to the world around. The pain undoubtedly caused by this action reawakens the character, her eyes filling with tears as she walks further alongside the wall as her body remembers that she survived the crash as not merely another spectre wandering around her crumbled life. It almost works as symbol of her first attempt to resist and alight over the tragedy. At this point in the film, this is seen as in impossibility, the same impossibility of wearing down a large stone wall with a single bare fist. 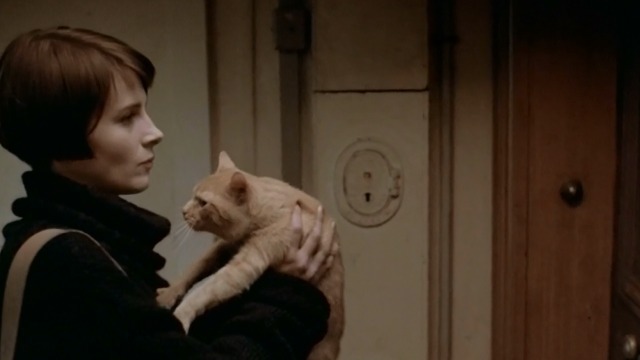 The film is replete with moments such as this, though Kieślowski has always denied most of the overt symbolic readings of his work. Yet few (aside from a gentle cafe scene later on) match that sense of the poetic and certainly not with the same rawness of emotion on display, bubbling up in attempt at release, to breathe after the blue of a watery grief has cascaded over the character. Her only option here, quite unconsciously, has been to find another pain, the pain of torn skin on stone, which is far easier to cope with in its immanent state than the seeming loss of everything that was important to her life. She may finish the piece of music, accept and forgive her husband’s infidelities and perhaps even find new love, for herself and for others, but at this moment, the pressure was so great as to seek the solace of an earthly pain over the existential pain caused by malicious chance. I think the DVD extras explain the circumstances: protection for Binoche’s hands wasn’t available in time, but she did the shot anyway. IIRC Kieslowski wasn’t happy that she actually scarred herself in the process.